This weekend Tawn and I flew to Macau for a week getaway. While the getaway was planned almost six months in advance, the timing couldn’t have been more perfect. With the ongoing political troubles in Krungthep, a week away was well called-for. This is the first time I’ve been to Macau and the only reason we flew there was because the tickets were one-third the price of tickets to Hong Kong. We spent one night and the better part of a day exploring this Special Administrative Region of China. The visits to the Venetian and the Four Seasons didn’t inspire me – I’m not a gambler and needn’t fly three hours to go to a mall. Tawn, however, did enjoy some time browsing the shops at the Four Seasons, coming away with several pages of notes on looks, styles, and outfits that interested him. Meanwhile, I sat at the espresso bar and worked, which was a good change of pace from working in my office. While waiting to order a latte, I observed the lady in line in front of me. She seemed very blurred for eleven in the morning. As she went to pay for her drink, she fumbled with her wallet and at least a hundred HK$1,000 bills fell out (about US$13,300). She didn’t have anything smaller with which to pay for her coffee. Must have been up all night and those were her winnings. She scraped them together and stuffed them back into her wallet. After the shopping we headed into the old city, which has a lot of European charm. 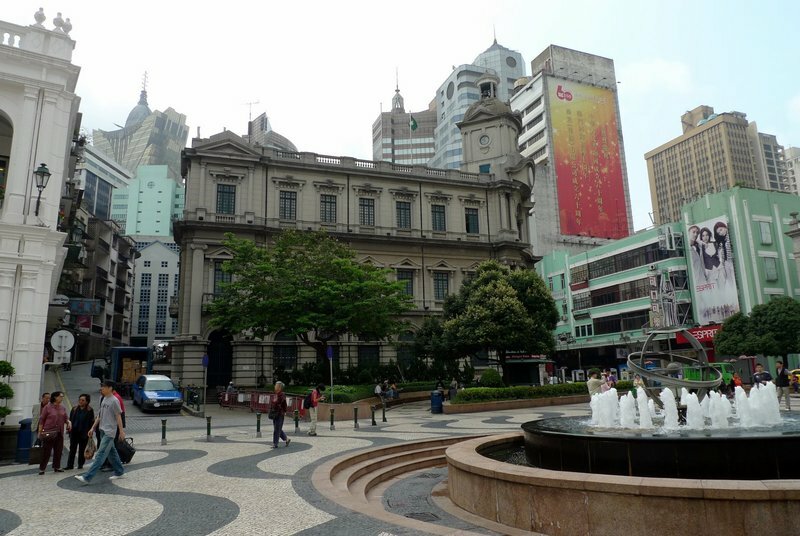 Senado Square and the old post office, above, are very pretty from an architectural standpoint but the shops could have been in any mall or shopping district most anywhere in the world. The further you travel, it seems, the closer you are to feeling at home. 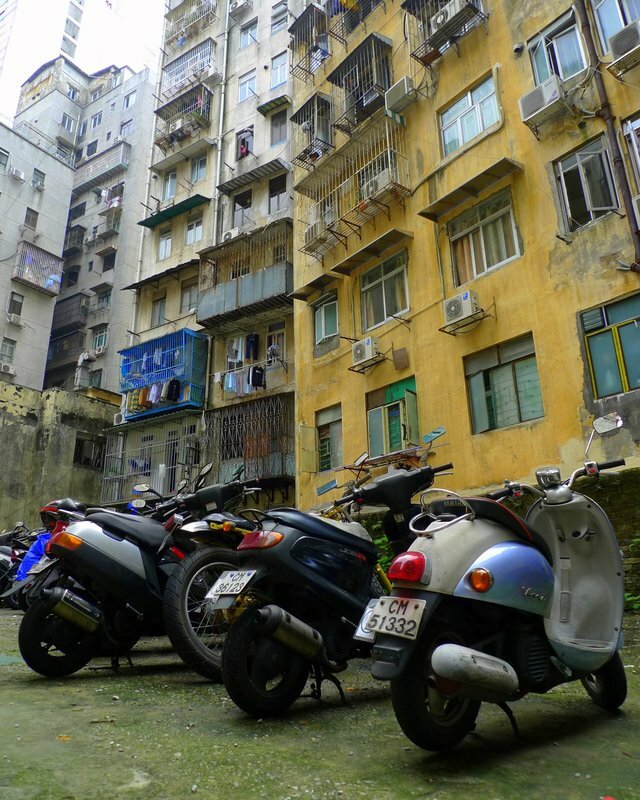 We headed into the side streets and alleys, though, peeling away from the tourist track and peering into the small shops and houses where everyday life takes place. 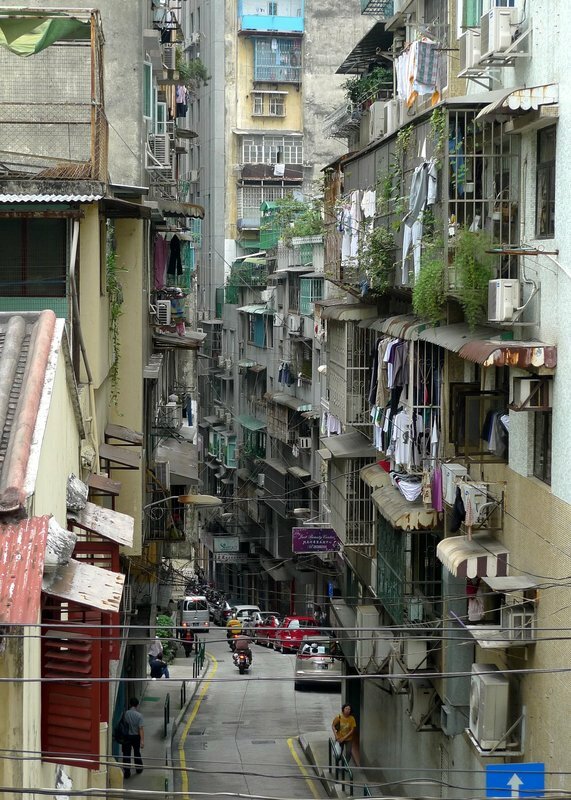 Narrow streets with tall buildings lining them curved and snaked down the sides of the hills. Even though it was a very humid day a nice breeze cut down these manmade canyons, making the weather quite tolerable. Many of the buildings had a faded glory to them, beautiful colors standing out against otherwise drab facades. Modern buildings with very utilitarian design stood shoulder-to-shoulder with more elegant European architecture. Sometimes as you walked along the street, it seemed as though you were going from Asia to Europe and back again, all in the course of a dozen buildings. Other areas, mostly those around churches and other tourist attractions, were very nicely done up with fresh paint and flowers. Interestingly, though, there were very few tourists in most of these areas and the stroll was quite pleasant. The payoff to our wanderings: the illustrious Portuguese Egg Tart. Flaky pastry with yolky egg custard with a lightly burned top. Perfection in three bites. This entry was posted in Uncategorized and tagged Egg Tart, Macau, travel by christao408. Bookmark the permalink. Macau Egg tarts!! Yumm! Tawn looked very fashionable, as always.There are a few mom and pop coffee shops hidden in the small streets near the square! 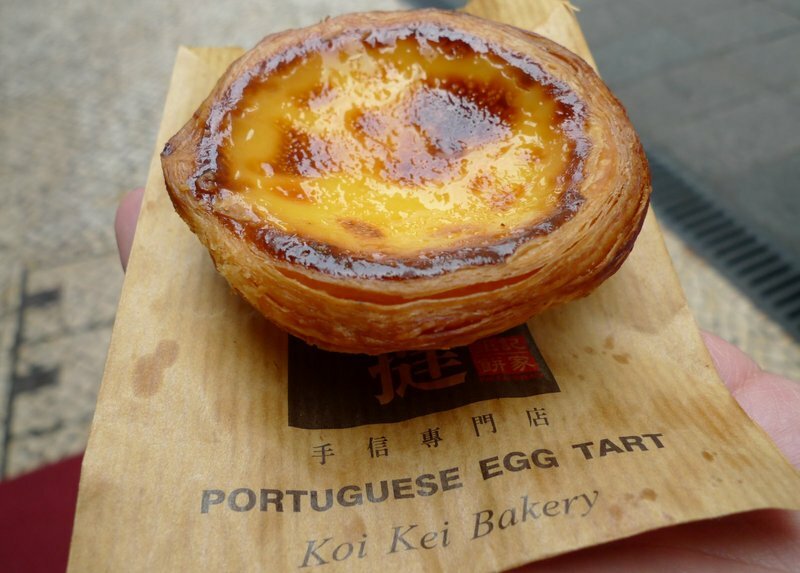 I miss those Porteguese egg tarts, yummy! You are very observant regarding the mix of Eurpoean and Asian cultures. Mccau was a Porteguese colony for hundreds of years. One good example is the picture of the tin shop. The shop name in Chinse directly translated as “White Iron”. The chinese name for tin. Next to it is the word “latoaria”, which is portuguese meaning “tin”. It is a small world after all! great pictures!! as always, love your posts! Gosh love those egg tarts!!! 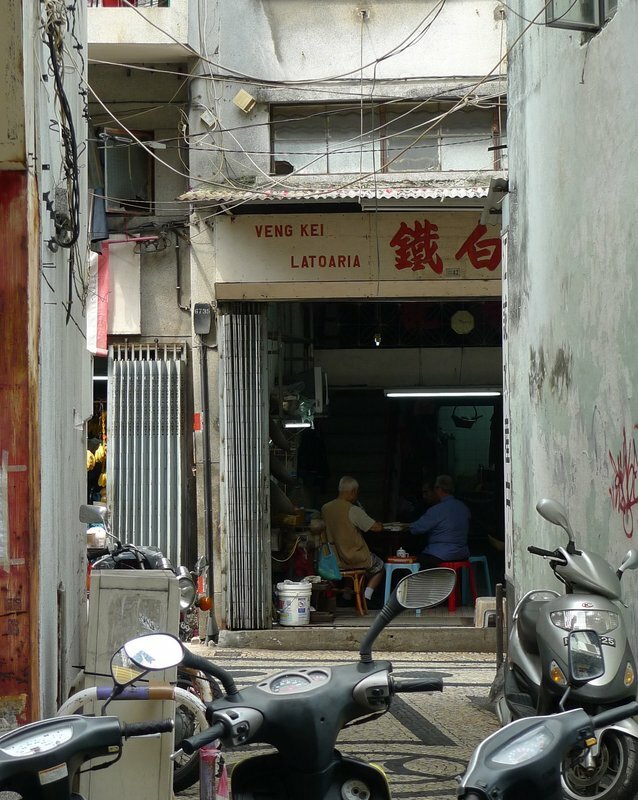 I often take strolls behind the glorious front of the streets to see what kind of lives go on there.BTW, egg tarts are a 2 bite food for me. I miss those Portuguese Egg Tarts. I always look forward to getting them whenever I was in Macau. Seems like an interesting place with some interesting visuals. The egg tart looks so awesome. Can you just get some and send it all the way to Delhi? Thanks for the travelogue. Looks really good. Man I miss those egg tarts. Had them all the time in Taiwan. Tawn have any fashion tips, cause I really do need them.Stupid factoid. 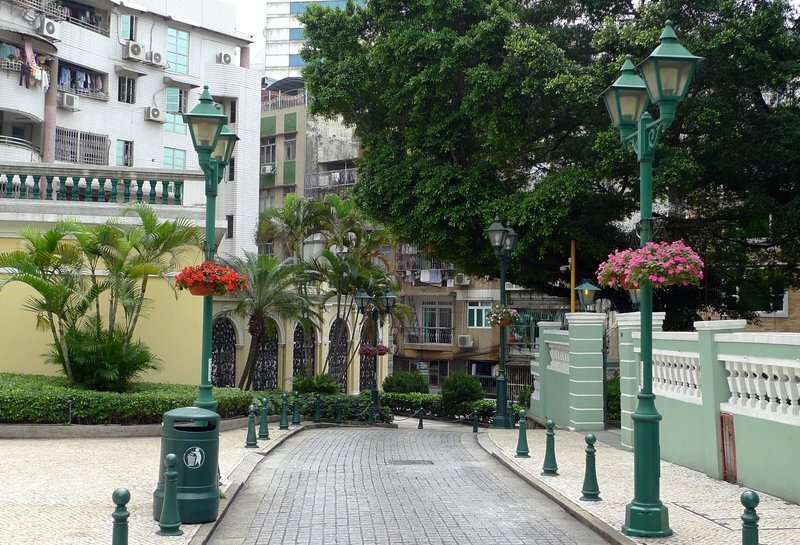 Although smaller, Macau generates more income than Vegas in every measurement except for the nightclubs. I’ve had those egg tarts! But not in Macau – a Chinese restaurant opened and had them briefly. Then they closed. Tough economy didn’t help and neither did putting it 2 doors down from a very successful Chinese buffet and next to one of the oldest Chinese restaurants in town… Haven’t seen them since. But they were very tasty. Have fun! It’s always interesting to wander around the local streets and away from the tourist sites. I love the picture of the manmade canyon. I don’t think I’ve ever carried that much money on me at any given time. I wonder what it feels like. Love the pictures as always!! I’m counting down to our trip to HK/Singapore in 2 1/2 weeks, and I was vacillating between going to Macau or not (don’t care to gamble either), but I love the pics of the buildings…hmm =) to go or not to go? BTW–is Tawn going to get someone to make those designs for him? =) I wish I could draw my own inspired designs and get them made! @lil_squirrel4ever – If you’ve been to Vegas, I would skip Macau. Just my opinion. @lil_squirrel4ever – I think he’ll keep those designs in mind for future shopping and outfit combinations. @ElusiveWords – I wish I knew what it felt like to have $13,300 on me! @murisopsis – The problem is that a lot of the Chinese restaurants use more of a pie dough crust rather than a flakey crust, and they don’t “brulee” the tops. @LostSock21 – I’m not surprised. The Chinese gamblers are much more serious than their Vegas counterparts. @Dezinerdreams – As a soggy, oily overnight express box arrives on your doorstep…@osmundaregalis – They just aren’t the same elsewhere, are they? @Wangium – So either you have a big mouth or I’m a dainty eater…@CurryPuffy – Wish I had found those. We did eat dim sum at one place but wasn’t all that good. @stevew918 – Thanks for that added insight, Steve. @Shades_of_Athena – Will have to add that to my to-visit list for the next trip! @sandelion23 – @ZSA_MD – I’m glad you enjoyed. @Redlegsix – Except with more hills. =D@yang1815 – I know, right? I’ve always wanted to go to Macau! I heard the Venetian there was ridiculously large. I think I would’ve enjoyed this European/Asian fusion of architecture. This is another place that I would love to go. I know that I would probably really enjoy the mesh of architecture (as would Phil, of course). I love cities where there really is a fusion of different kinds of architecture. That’s definitely something that we don’t see here in DC. You either have brutalism in some of the federal buildings built circa late 60s or early 70s or you have the pseudo-Greek of other federal buildings built early 60s and prior! 3 bites? i thought all you need is just 1 bite? yum. 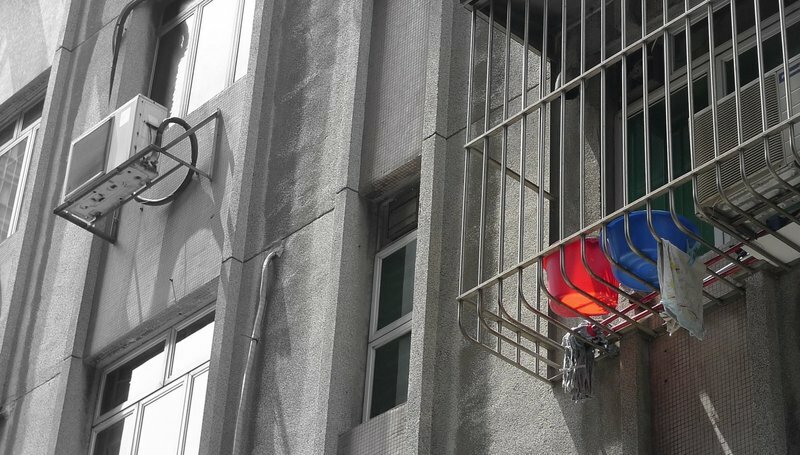 @christao408 – There was a craze about it in the 90’s in Taiwan haha. Always enjoyable entry! I find that I can now start to re-enter some form of normalcy after our baby’s birth, and following your blog again. Love the egg custard! Looking forward to a post on Tawn’s future designs! Tawn looks really great with the hat on, but is it on backwards? Glad you had a nice trip. I guess I have a big mouth…but I think Rudy has an even bigger mouth. 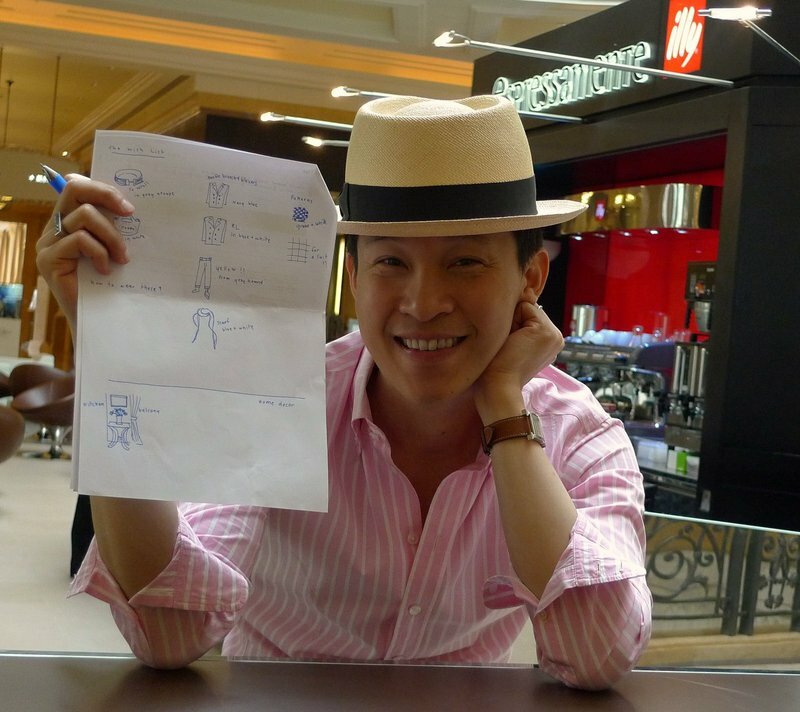 @yang1815 – Right before or after the boba tea craze? @Wangium – Well, that goes without saying. LOL (just kidding…)@Toro69 – Good question. I think he pulled it on just for the picture so maybe it was intentional? @doiturselfer – Welcome back, Ryan. @christao408 – I don’t recall a crazy for boba tea. It was just, there. So I’d say after?